Dean Brown’s new CD is just about to release. 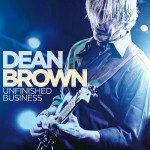 We had an exclusive look behind the scenes in the studio and Dean told us much about the making of UNFINISHED BUSINESS. You guys are amazing! Thanks for this great episode about Dean! Hope to see more interviews behind the scenes like this ….